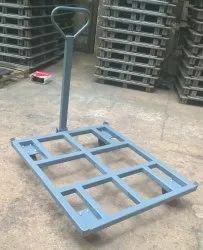 We are one of the leading manufacturera and Supplier of Pallet Dolly. MS Pallet dolly is designed to transport Pallets and Bins with ease and without any handling equipment. Features heavy duty 1.5''WX4''dia, 2 swivel wheels and 2 fixed type castors.